Primarily, we consider ourselves to be service providers that assist industrial and trade clients with everything from planning to completion. We work closely together in order to provide practical solutions for your individual needs. Our experienced employees are DVS certified and available 24 hours a day all over Europe. 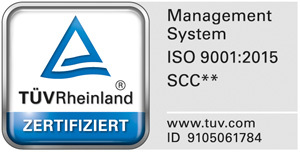 We are ISO 9001 and SCC certified. The assembly and disassembly of plastic and steel piping is one of our specialities - just like all types of lamination, welding and coatings in connection with overhauling industrial facilities. Our clients are not only from the chemical industry, incinerating plants, steel and water works, wastewater treatment and waste air purification plants but also industries that utilise aggressive chemical substances.